This year the Chinese Mooncake Festival is fall on the 22nd of September, Wednesday. And it's about time to make my third batch of mooncakes. Remember the mooncake biscuits I made the other day. It's all gone! This morning, I went for more lotus paste fillings but the store owner said there's no more stock left. Luckily, I still have 3kg left with me. So, just make whatever I have in hand. I'm glad I'm making my homemade golden syrup this year. The process is actually pretty easy. Probably, I'll try to make the lavender golden syrup next as well. And here's the recipes. Have fun! - combine water and sugar in a non-stick pot and boil over high heat. - once it's boiled, add in lemon juice and let it boil for another 5 mins. - at this moment, do not try to scrub the side of the pot with your cooking utensil, cause the sugar might cystalize at the side. You may use a damp cloth for the cleaning. - finally, reduce to low heat and simmer for about an hour (do not stir the mixture). - mine is exactly 1hour 10mins, the syrup looks very runny while it's hot but will became thick after cooling down. 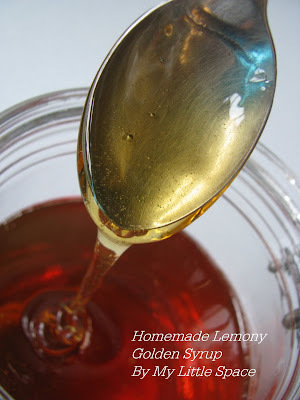 - if you prefer to omit the lemon juice, you may as well cut down the simmering time. Fillings : about 1-1/2 kg lotus paste. *mung fillings : refer here. To Assemble : refer here. Finally, bake at 170-175'c for 10 mins and then brush with egg glaze, bake again at 160'c for another 10 mins or untill brown. And don't forget to VOTE for me! THANK YOU ! All of these moon cakes look so pretty. I would love to see what a moon cake festival is like. I voted for you and will keep my fingers crossed for you daaaahling! Very cool mooncakes! Voted for you! Your mooncakes are the best...I wish I could take a bite of any one of them! They are just stunning! 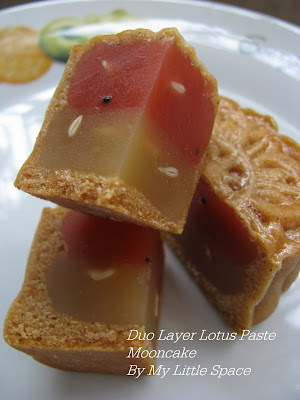 I wonder how the guava paste would work in a mooncake? Best of luck in the challenge Kristy! I voted for you! Impressive you made your own, but why am I surprised? Of course you have my vote! Nice mooncake and Happy Mid Autumn Festival! Very creative in infusing different flavour in your mooncakes where most homebakers will just make the traditional ones. Well done! Kristy, nice mooncakes and you will have my vote, wish you best bester bestest lucksssss on winning! already voted for you! !btw, i'm done with the logo that i asked u earlier and Happy Mooncake Festival!! Kristy, you are absolutely amazing. I am impressed. Each time, I visit here, you have something that I am in awe of. This is the best. I am off to vote. Good luck. I do hope you win. You deserve it. Finally found your blog & voted. All the best! I would love to try your charcoal mooncke! I'm actually quite busy for the past few days. Hubby is sick. He's getting better now. Thank you all for stopping by and hope you're all having a wonderful day. Oh that Charcoal Mooncake is so unique. Wor, the charcoal mooncake look so beautiful and I bet it must be tasty too. Ok, will press the Voting button immediately. Kristy - your mooncakes just enchant. I love that there is no more lotus paste in the stories! Just thinking of everyone baking away. And voted - good luck! Wow, Kristy these mooncakes are like a work of art. Beautiful. Kristy, your mooncakes are SO SO cute :-) Love the 2 layers one! amazing talent here and you have my vote for sure, its in! You are a very talented and creative cook. 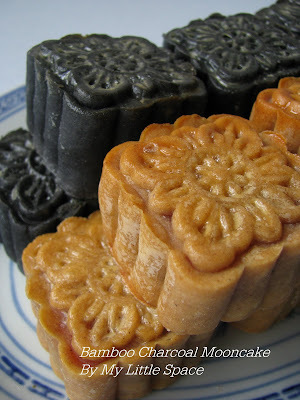 The bamboo charcoal moon cake is a new flavour which I can't find it in the market yet. I definetely agree you should open your own bakery shop. Happy Mid Autumn Festival!! Lovely mooncakes you have here. Too pretty to be eaten. Anyway, I've voted for you for the Project Food Blog! All the best..
Oh my goodness...you added charcoal powder to moon cake skin!! That's new to me! Wonder what next to add....haha. Happy moon cake festival. Hope you have a great day. Going to vote for you. Good Luck! wow kristy, these are gorgeous! 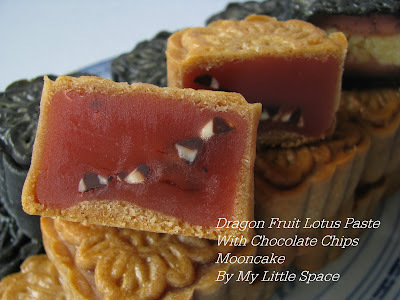 These are stunning mooncakes Kristy! Would love the cinnamon ones! And you can vote for up to 400 people in the competition. It's a great honoured for having you here and thank you so much for your support and encouragement. Even if I'm unable to make it to the following round. It's OK! I'm happy enough to have such a bunch of wonderful buddies around me. Thank you all. Love you guys! 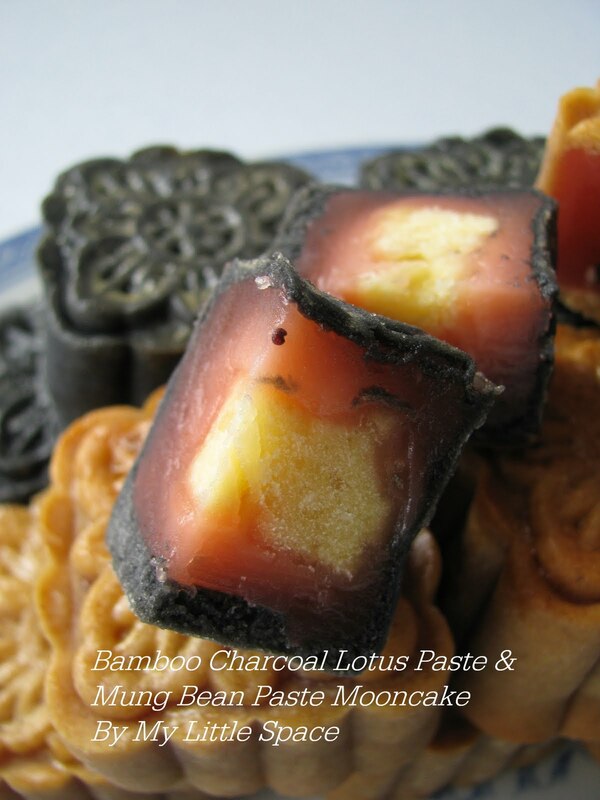 I m wondering how is the taste with bamboo charcoal mooncake? I never made baked mooncake before, planing to try this out soon.